The Samson "Silent" Dehydrator is compact in size and allows you to dehydrate up to 6.5 square feet of items at one time. Enjoy fresh, delicious, homemade dried fruit and vegetables, fruit leather, trail mix nuts and berries, dried herbs and spices, potpourri, pet foods, yogurt and much more. 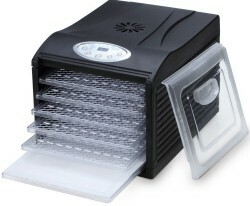 Enjoy all your homemade dried favorites with the Samson Silent Dehydrator. Perfect for everyone from outdoor hobbyists to the health-conscious vegan, vegetarian and raw foodists, this dehydrator is designed for efficient, even drying. Fruit leather. Trail Mix. Kale Chips, Flax Crackers, Jerky, Flat Breads, Custom potpourri. Dried Herbs and Spices. Prepare all this and more with just a flip of the switch! 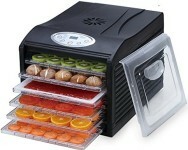 The Samson Silent dehydrator handles everything from fruit slices to beef jerky on six spacious, height adjustable trays. The automatic fan promotes even drying and prevents the overheating that eliminates food's vital nutrients while the adjustable thermostat ensures that all foods are dehydrated at their optimal temperature. The Samson Silent dehydrator offers a generous 6.5 square feet of dehydration space. 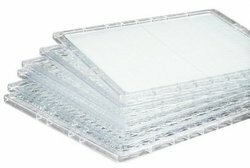 Trays can be removed to increase the drying height as needed. This dehydrator includes a BPA-FREE see-thru door that enables you to check on the food you are dehydrating without having to open the dehydrator. What is a Premiflexx non stick dehydrator sheet?Our Premiflexx non-stick sheets are solid sheets, unlike the mesh sheet that is included with the dehydrator. They are washable and re-useable. They are used for dehydrating liquids (such as blended fruits- to make fruit roll-ups) or really sticky/gooey items that would normally drip through the mesh sheet that is included with the dehydrator. They are also required for making THIN sprouted essene breads and crackers. Order Premiflexx sheets separately here. This dehydrator feature horizontal air flow which promotes even drying compared to inexpensive vertical air flow dehydrators. The digital controls on the dehydrator allows you adjust the temperature inside the dehydrator from 95 degrees F to 155 degrees F.
The Samson Silent Food Dehydrator is engineered to last. The 5 year warranty is your commitment to you that your dehydrator will provide many years of trouble-free operation.